Björn is an experienced game developer and designer. He has worked on numerous games for both Android and iOS. Having been blown away by virtual reality he dropped everything to start a game development studio of his own. A prolific programmer and game developer. He's studied audio engineering and has been playing the guitar for as long as he can remember. If something makes a sound then Einar is in charge of it. An illustrator by trade, he has a Bachelor of Fine Arts from Laguna College of Art and Design in Illustration Entertainment Design. Sigmundur brings our games to life with beautifully designed characters and environments. Diðrik is an experienced project manager having spent the last 5 years funding and running small startup companies. he also has experience in 3D sculpting and is a Unity generalist. Ingunn is a talented artist that studied Illustration with Emphasis of Entertainment at Laguna College of Art and Design. Her comic book knowledge helps bring out that special spark we need. 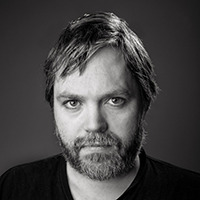 Jónas Valtýsson is a graphic designer, image maker and art director. He's especially well versed in UI and UX design. He loves pixel-art and hopes to achieve mastery in the form. Ottó is an independent script writer with many years of experience. He's written and worked in the develop-ment of a plethora of Icelandic and international feature films and documentaries. Jónsson & Le’macks is a branding and advertising agency based in Reykjavík, Iceland. We at Porcelain Fortress have partnered with them to create truly fantastic experiences and products.